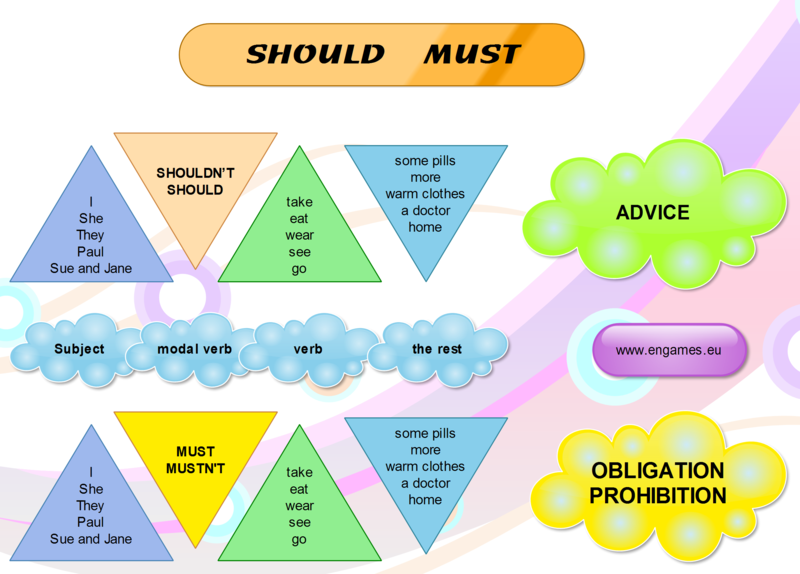 This post deals only with the basic usage of the modal verbs SHOULD and MUST. I have recently written a post on Modal verbs. This post was aimed at intermediate students and it demonstrated the usage and meaning of all the modal verbs in present and past tenses. You can find here a graphical presentation of the usage of the verbs SHOULD and MUST and several completely new games to practise the usage of these verbs. This time there are three different games to practise the two verbs. All the games are completely new and in one case there is more playing than learning. The first game is called Reaction. Your task is to answer each question by filling in SHOULD or SHOULDN’T. If you answer correctly you have to wait till the frog appears. Once it appears, your task is to click on it as quickly as you can. My record is 18,250. Will you be better? The second game is the one where you will play more than learn. Your task is to fill in SHOULD or SHOULDN’T. After each correct answer you can play the Hot race. However, if you do not like the game you can skip it by clicking on the NEXT button. My personal best is 1:22 on the first circuit. In the third game you have to complete the sentences with MUST or MUSTN’T. If you complete the whole exercise correctly, you can play the game Rock, Scissors and Paper. Can you beat the computer? Do you find this blog interesting and innovative. Then you can like it at British Council Teaching English Facebook page. Ours is the HOW post. Love this articles I got 21500 in first quize second one I couldn’t open should renew my flash player as it seems. It depends what device are you reading it on. Sometimes, using a different browser helps too. well..i agree..bt i think that u should add other alternative.